The free internet connectivity current Tesla owners enjoy may become a paid-for extra for new owners buying a car from the firm after July 1. Update: Tesla has confirmed to TechRadar that a charge for the Premium Connectivity Package will come into effect for any cars purchased from July 1, 2018. First leaked via an internal sales team email seen by Electrek, and then confirmed to TechRadar by the automaker, Tesla will introduce a premium connectivity package for all its vehicles from July 1. 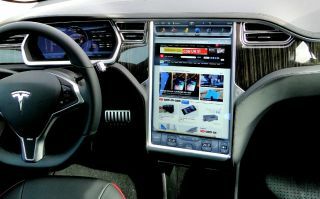 The move means you'll have to pay an additional fee if you want the expanded internet connection in your Tesla (above the core connectivity the car requires, such as the sat nav and supercharger network information). There's good news for current owners of the Tesla Model S, X and 3 though, as the annual charge will not come into effect for any models currently on the road - ensuring you maintain free connectivity in your vehicles. However, for any new features and upgrades (not including security and safety updates) beyond July 1, currents owners will need to upgrade to the premium package to take advantage of them. The news doesn't come as a surprise, as back in 2014 Tesla said that Model S owners would get free data connectivity and internet radio for four years - which takes us to 2018. It appears Tesla will be true to its word, but the fact current owners won't be required to pay is positive news. From July 1, any new Tesla vehicle will come with two options; 'Standard Connectivity Package' provided at no extra cost, and the 'Premium Connectivity Package' which will require an additional payment, but the exact amount has yet to be revealed. Tesla says it will be around $100 (around £75, AU$135) per year. If you plump for the premium package you'll get satellite map view, live traffic visualizations and the ability to use the web browser and stream music using the cellular network connection. Model X and Model S cars purchased after July 1 will get the premium package free for a year, while new Model 3 owners will also get a free year if they opt for the premier interior option. Once your free year is up, you will be able to purchase the Premium Connectivity Package via your vehicle's touchscreen, or you'll be reverted back to the Standard Connectivity Package.